This 398-acre park has the highest elevation campground of any park in Vermont, at 2400 feet. Woodford is located on a mountain plateau and surrounds Adams Reservoir. The high elevation spruce/fir/birch forest provides an ideal setting for the park. Woodford borders the George Aiken Wilderness Area, which is in the Green Mountain National Forest. There are several lakes and ponds in the surrounding area. 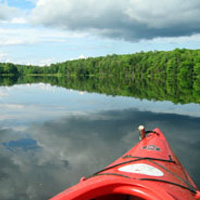 Here's the our members favorite photos of "State Parks in Vermont". Upload your photo of Woodford State Park!